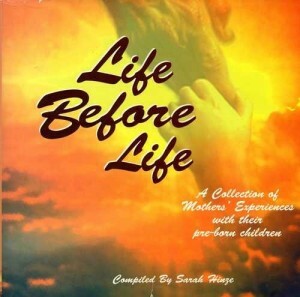 Complementing the widespread information on “life after life” found in many near death experience accounts and in ancient texts (including the Bible), Sarah presents evidence in all of her books for “life before life” through accounts of pre-birth experiences. Personal accounts in Memories of Heaven suggest exciting answers to these questions, especially where we come from before we are born. These memories are messages from our true Home and offer a glimpse of the eternal nature of each human being. Discover exciting mysteries most of us have no memory of, including glorious gardens, buildings, and fountains; friends and family and the promises we made to them, and the many ways we prepared for our lives on earth. These memories will open your eyes and heart to your true worth, your limitless potential, and how completely you are loved. Discover who you really are, where you came from, why you are here and where you are going. And maybe a few of your own memories of life before birth will awaken within you. * A letter from a mother to her son, whom she gave up for adoption, telling him of the dream that guided her through that painful decision. * A kidnapped child who survived her ordeal by the guiding hand of the baby sister who would be born years later. * A little boy’s memory of being brought to earth by his grandfather–a man he never knew. * A woman’s vision of a child in a garden, and the powerful certainty that he was her son, waiting his turn to come into this world. Sarah Hinze’s own personal pre-birth experiences complete this inspiring collection, which radiates a universal sense of peace, joy, and hope that touches us all. When a troubled three-year-old boy began telling his parents about being in the tummy of his “other mommy,” to his parents it seemed nothing more than a childhood fantasy. But his supposed memories only grew more vivid, as did his love and longing for the mother he felt he had lost. Little could anyone imagine the astonishing revelation that would come several years later when he met a friend of the family! This remarkable book tells his story and that of many like him. 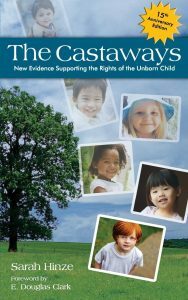 This 15th anniversary edition of The Castaways, updated with many never-before-published accounts of pre-birth experiences and the latest research, examines what happens to souls who attempt to come to the earth but are blocked through abortion. In analyzing collected accounts, a sampling of which are in The Castaways, a surprising picture emerges of what may be happening to the spirits of those aborted–the castaways. Songs of the Morning Stars, at the time an updated version of The Castaways, was published in 2006 by Spring Creek Book Company. We Lived in Heaven at the time was an updated version of Coming From the Light published in the same year by Spring Creek Books Company. These are now out of print. This is Sarah’s second in her series of pre-birth experience books, which is currently out of print. Look for it later this year under the same name, published by Three Orchard Productions. Sarah, with her husband, Brent, began to notice one particular pattern among the PBE accounts they continued to gather: Accounts that dealt in some manner with the grief and loss of miscarriage, stillbirths, adoption and abortion which were both heart-wrenching and healing at the same time. 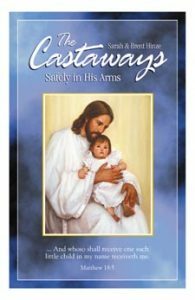 For over 15 years, The Castaways, which was self-published by the Hinzes, has been sold internationally at bookstores and conferences. It has been adopted as a resource at various social services centers and private counseling practices. Content from this book has been an effective tool in lobbying against partial birth abortion at the state level, in national policy meetings, and at international conferences. It has been distributed to United Nations’ family-friendly delegates at World Family Policy Center meetings and various international conferences. International non-governmental grassroots and interfaith organizations have used this book to change hearts. 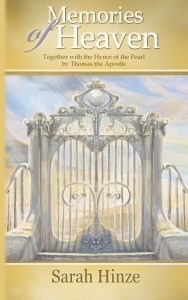 If you have lost a child, or are trying to conceive a child, or cannot bear children, this book will provide enlightenment, hope, and healing. You will see that relationships can be eternal and God’s grace can provide rewarding surprises along the way. This was published by Simon & Schuster in 1997 and is now out of print. 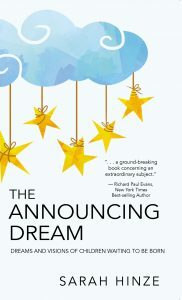 It was republished in 2016 by Three Orchard Productions under the title, The Announcing Dream, now available in Kindle and paperback at Amazon.com. The book that started it all! Sarah’s first hardcover book was published by Cedar Fort, Inc. in 1993. This is the earliest incarnation of what has been recently published under the title, The Announcing Dream.